South Korean shooter Choi Young-jeon won a gold medal in the men's 300-meter standard rifle event at the 18th Asian Games on Friday. 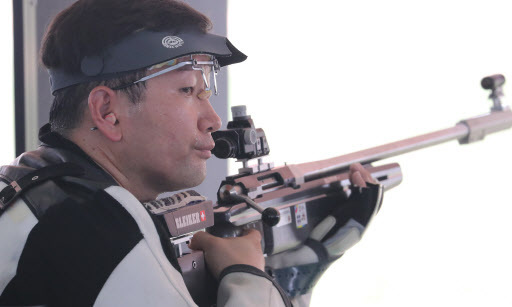 Choi scored 569 points to finish first among 13 contestants at the Jakabaring Sport City Shooting Range in Palembang, Indonesia, the co-host city of the Asian Games with Jakarta. Hussain Alharbi of Saudi Arabia took silver with 568 points. Lee Won-gyu of South Korea took bronze with 563. In an event where participants shoot in three positions, Choi started with the best score in kneeling with 196 points. The 37-year-old, who is also an Army master sergeant, later scored 189 in prone and 184 in standing. Alharbi had 190 in kneeling, 194 in prone and 184 in standing. With Choi and Alhabri completing their match first, Lee had a chance to move up to first place. But he struggled in standing, getting only 179 points. He earlier had 190 in kneeling and 194 in prone. This was South Korea's second gold medal in shooting at Jakarta-Palembang 2018. On Thursday, Shin Hyun-woo topped the men's double trap competition.